Seoul, Korea – September 11, 2006 – Samsung Electronics Co., Ltd., the world leader in advanced semiconductor technology solutions, today announced that it has developed a new system-on-chip (SoC) solution for its hybrid drive. Samsung introduced this new SoC solution at its sixth annual press conference in Seoul today. In the hybrid drive, Samsung’s new SoC supports up to 4Gb flash memory as a data buffer. It maximizes the ‚disk spindle down‘ mode and reduces power consumption levels up to 80 percent compared with the conventional HDD (hard disk drive) and improves drive reliability. It also supports the initial boot from the OneNANDTM, reducing the overall boot time by over 10 seconds. Samsung’s SoC solution for the hybrid drive incorporates a high-speed serial ATA interface with native command queuing, an HDD controller, a SDRAM controller, a OneNAND controller, and Agere read channel into a single piece of silicon. The SoC solution also includes a dual CPU core (ARM7 and ARM9) embedded to enable independent operation of the memory, HDD, and motor. The hybrid drive solutions Samsung developed are collaborated efforts of each business division: Memory, System LSI and Storage. 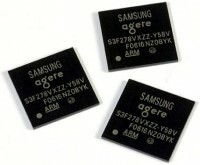 Samsung plans to mass produce the SoC in November.